Here in the PNW we are extremely lucky with all of the great breweries, wineries, distilleries that we have around us. Coming from Portland, there was a brewery around every other street. Some good, some not so good. Now living here in Hood River, it is similar, lots of great food, fantastic wine, and unbelievably good beer. We are lucky. And one of my favorite places to go whether it is with friends or family (kids in tow) is Double Mountain. Great place, fun environment, and some of the best pizza I have ever had. The Truffle Shuffle is my absolute favorite. So when it came time to make dinner this week, I had already been in the kitchen all day making these, so I wasn't in the mood to start the oven and begin the whole process over. That is where the best part of summer comes in. BBQ + grilling. Poaching the sausage first in Double Mountain Kolsh, butter, onions and garlic and then grilling them till perfection. Then the easy part, taking all of the tomatoes and peppers that we had, tossing them in olive oil, a sprinkle of salt and sliding them on the skewers. Fast, easy, and good! Isn't it funny how roasting or grilling can take a vegetable and go from ok to perfect with just a bit of heat. This dinner was exactly what I wanted and needed. Easy, fast, and loaded with flavor. Served along with our favorite beer. It was a good night. Using a large pot or dutch oven, combine the beer, onion, garlic and butter. Bring to a boil. Once the butter has melted add the sausage, salt and pepper. Reduce to medium-low and cover the pot and cook for 10-12 minutes, until cooked. Remove the sausages from the liquid. Continue to cook the liquid until it has reduced by half. Set aside and reserve for serving. 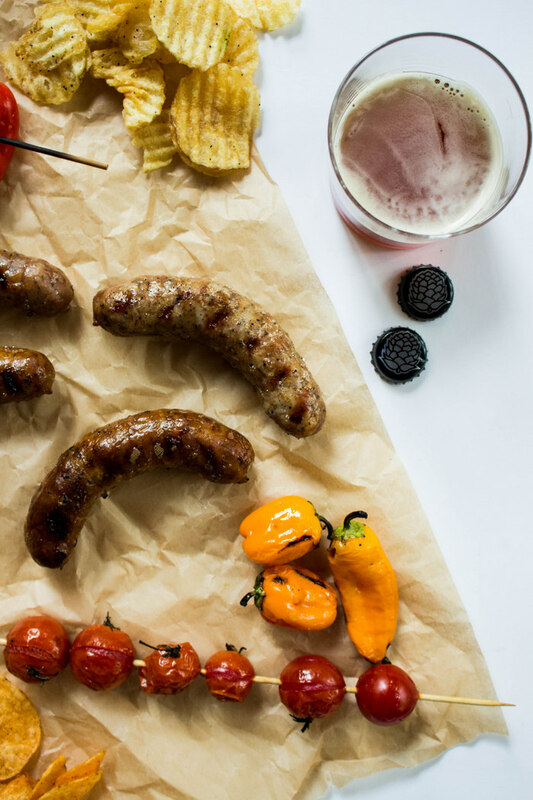 Cook the beer soaked sausages on a preheated grill for 5-10 minutes. 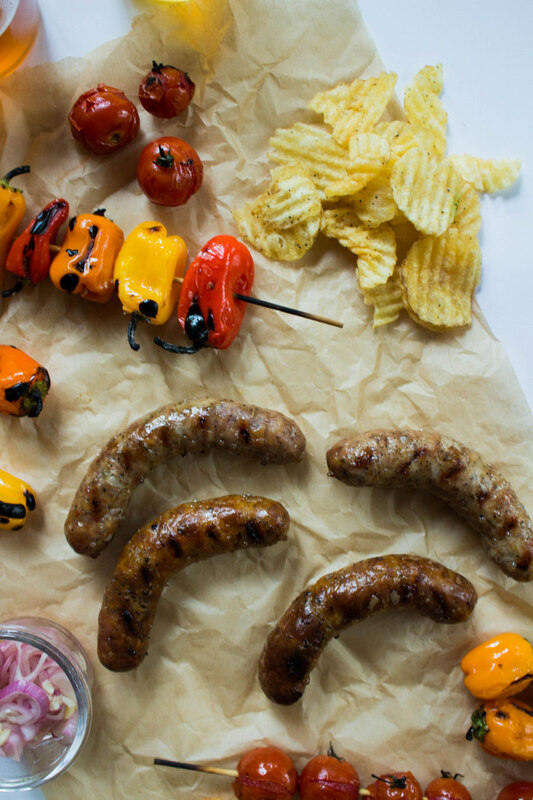 Place the sausages back into the reduced sauce while you prepare your sides and toppings. Serve sausages in a bun or separately with the sauce and onions. Bon Appétit Presents Feast Portland: A Celebration of Oregon Bounty is the flagship food and drink festival in the Pacific Northwest, capturing the current energy and enthusiasm driving America’s food revolution. Feast Portland showcases local culinary talent and Pacific Northwest ingredients alongside internationally recognized chefs, culinary professionals and industry leaders. Feast Portland is also a festival with a mission, donating its net proceeds towards ending childhood hunger in Oregon and around the country through Partners for a Hunger-Free Oregon and Share Our Strength’s No Kid Hungry® campaign. Many of my favorite artisans, breweries (including Double Mountain! ), chefs, distilleries, and wineries will be at this years Feast, September 18-21. Tickets are selling fast, be sure to get yours now. If you buy tickets and attend one of the classes, events, tastings, dinners, LET ME KNOW! I will be there, eating and drinking my way through it all.